Nothing jump starts my day more than an invigorating shower. It wakes me up and gives me that initial push I need to start the day. And when I have the perfect bath and body products, it's even better! The right products can amp up your shower and rev your up. Recently I was introduced to Obiqo, a sea-inspired skincare line created by Kiwi, Phillippa Fletcher. Obiqo combines nutrient-rich sea kelp straight from New Zealand's pristine waters with the fines Europen anti-aging extracts and powerful anti-oxidants of French organic sea lavender. This powerful combination creates a range of products that feed your skin and your soul. In addition to several different types of facial creams, serums, cleansers and scrubs, Obiqo has a line of bath and body products. Since my facial skin is very sensitive, I chose to receive the Body Wash and Body Butter Duo, a delicious combination that will leave your body feeling fresh, clean, and silky soft. The very first thing I noticed about the Obiqo body wash was its glorious scent. Its combination of sea lavender, chamomile, and cucumber is light and refreshing. It leaves a clean, no-film feeling on your skin. After drying off, I applied the body butter. It goes on smoothly and is thick but not so much so that you feel as if it's layered on your skin. In the evenings before I go to bed, I can still feel the body butter on my skin. There was no need for me to reapply it before bed. It deeply moisturizes and lasts the entire day. It has a very light, pleasant scent. Overall consensus: I loved both of these products. Their effectiveness combined with the top-notch sea-extract ingredients are a winning combo of luxury for your skin at a price tag that's more than reasonable. 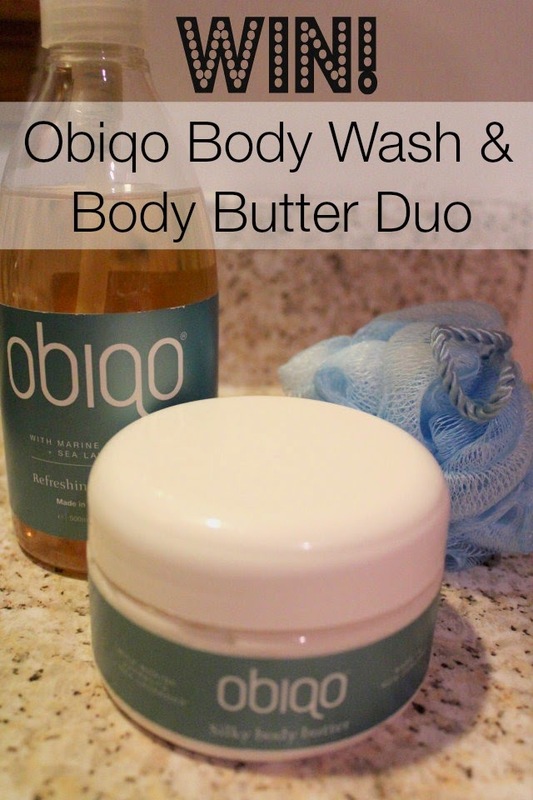 Obiqo is offering one lucky Pieces of a Mom reader the opportunity to win a Body Wash and Body Butter Duo (total value $37). Receive special offers and stay-up-to-date on the latest Obiqo news by signing up for the newsletter. Disclosure: I received a complimentary Obiqo Body Wash and Body Butter Duo to facilitate this review. No further compensation was received. All opinions are my own.